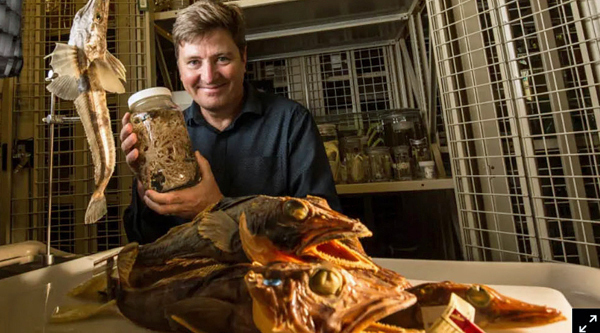 Dr Tim O’Hara with specimens from the museum’s collection. In the jar is a brittle star. Credit: Scott McNaughton. Some types of sea-urchins are testing out new reproductive techniques, giving birth to live young rather than dropping eggs into the freezing water. Fish, shellfish, sea stars – you name it, it’s changing. Why all this evolution is happening remains a mystery, but the scientists suspect it may reveal evidence of a mass-extinction event that occurred millions of years ago, which life in the deep is only now recovering from. Dr Tim O’Hara, a senior curator at Museums Victoria, and a team from the CSIRO have spent the past few years taking boats out into the hairy conditions of the Southern Ocean, fishing up to four kilometres beneath the surface for some of the most extreme animals on Earth. By way of comparison, a nuclear submarine can dive to a maximum depth of just 500 metres. They’ve found huge creatures with fishing rods for heads, zombie worms, bioluminescent sea stars, meat-eating sponges and tripod-fish, strolling through the ocean on stilt-like legs. Combining the results of those studies with genetic data and hundreds of thousands of animal-sighting records from museums around the globe has allowed them to build, for the first time, a comprehensive atlas of life in the southern oceans. With all the data collected, they decided to first look at brittle stars, a good group to examine because they are abundant on the seafloor. Brittle stars look like terrifying relatives of starfish. They lack a brain or eyes, but can sense their prey in the water and swim toward it with their long, spiny arms. Some eat detritus; others use their spiked arms to catch any fish foolish enough to stray too close, pulling the fish in towards their mouths. They found brittle stars appeared to be evolving much faster in the Antarctic than anywhere else in the world. If it is true of brittle stars, it is likely true of other species. Their dramatic finding, published in the Nature journal on Thursday, suggests there has been an explosion of life in the deep waters off Antarctica, with a new species being pumped out into the world’s oceans.